White was nominated for an Emmy in 2011 for her portrayal of “Elka,” the snarky but lovable caretaker on the TV Land series “Hot in Cleveland,” in which she stars alongside Valerie Bertinelli, Jane Leeves and Wendie Malick. Betty also won back-to-back Screen Actors Guild Awards for Outstanding Performance by a Female in a Comedy Series in 2011 and 2012. When she hosted NBC’s “Saturday Night Live” in 2010, it was one of the highest-rated episodes in the show’s history, and earned her an Emmy Award for Guest Actress in a Comedy Series, bringing White’s Emmy total to seven awards. She returned to SNL for a guest spot on the show’s 40th Anniversary Special. Betty was also Executive Producer and Host of the hit NBC series Off Their Rockers, and is now serving in the same capacity for the Lifetime network. 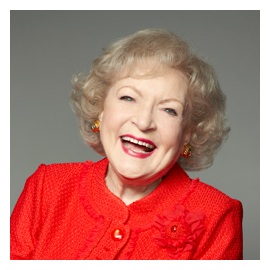 Betty received an Emmy nomination for the 2014 season for hosting Off Their Rockers. The most recent of her eight books include “If You Ask Me (And of Course You Won’t”), released in May, 2011 which earned Betty a Grammy Award. “Betty & Friends: My Life at the Zoo,” was released in November, 2011. Betty has also been named the world’s Most Trusted Celebrity according Reuters for back to back years. White’s awards are numerous, and include the Career Achievement Award in 2009 from the Television Critics Association, , the Screen Actors Guild Life Achievement Award in 2010, and a Lifetime Achievement Award in Acting in 2010 from the American Women in Radio and Television. She was voted AP Entertainer of the Year in 2010, and was given the Lifetime Achievement Award in addition to being inducted into the Broadcasting and Cable Hall of Fame in 2011. More recently she has received the TV Land Legend Award and Daytime Emmy’s Lifetime Achievement Award as well as being honored in 2017 with The Icon Award for Women in Television from the Paley Center for Media. A passionate supporter of animal health and welfare, White is a trustee of the Greater Los Angeles Zoo Association and serves as President Emeritus of Morris Animal Foundation, where she has been a trustee since 1971. She has also long been involved with Actors and Animals for Others, The Monterey Bay Aquarium, The Aquarium of the Pacific, Tree People, and Guide Dogs for the Blind in San Rafael, CA. In 2006, she was honored by the City of Los Angeles at the Los Angeles Zoo as “Ambassador to the Animals” for her lifelong work for animal welfare. In 2009 she received a Lifetime Achievement Award from the Jane Goodall Institute. In 2013, she was awarded the Conservation Advocate Award from the Zoological Society of San Diego, and more recently she was honored with the James Smithson Bicentennial Medal for her commitment and many years of work on behalf of animals, wildlife and the environment. She was proclaimed an honorary forest ranger by the U.S. Forest Service in 2010 and made an honorary zookeeper by the keepers of the Los Angeles Zoo — two occupations she considered as a child and before becoming an actress. She was married for eighteen years to Allen Ludden, host of the game show “Password,” until his death in 1981. Betty resides in California with her golden retriever, Pontiac.